Saint Peter’s is part of the Anglican Communion which totals over 77 million people worldwide. With origins in the English Reformation, but roots that can be traced to the early Church, Anglicans are a unique blend of several great traditions of Christianity. Anglicans are Evangelical, Charismatic, and Catholic. 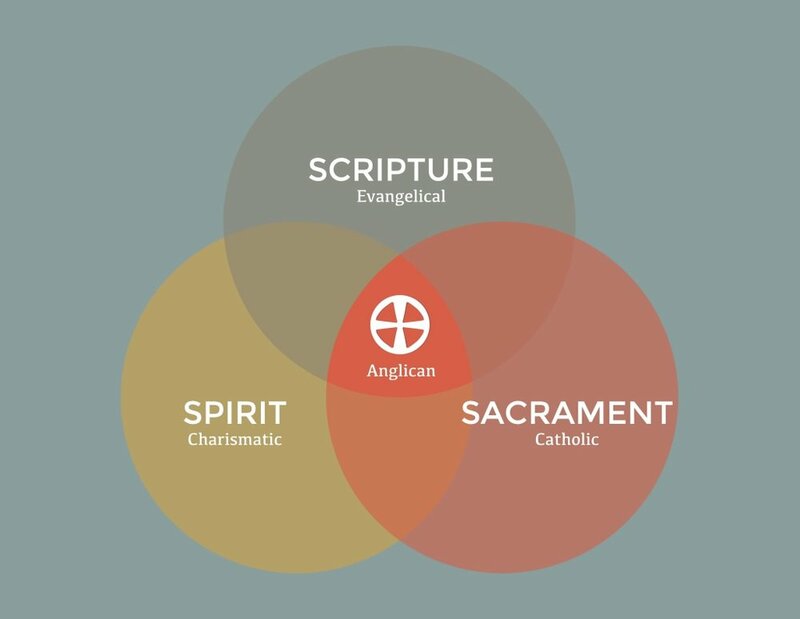 At its best, Anglicanism seeks to hold these three streams in a healthy tension. As Evangelicals, Anglicans acknowledge that the Scriptures contain everything necessary for salvation and life. In them, we not only find truth upon which to build our lives, more importantly, we are faced with the reality of Jesus Christ. Anglicans believe that the cross of Christ has made a way for sinners to be transformed by the living God and we feel compelled to proclaim this good news in word and deed. As Charismatics, Anglicans believe the Holy Spirit has been active throughout history in the Church and empowers Christians today with gifts to build up the Church and reach the lost. Jesus promised to send the Holy Spirit to be with his followers after his Ascension. We believe that promise and seek to surrender all of our lives to his power and presence. As catholic Christians, Anglicans have a high view of the sacramental life of the Church. We recognize that the Church didn’t begin with the Reformation, and embrace the aspects of Roman Catholicism that are rightly aligned with Scripture. Anglicanism seeks to embrace the foundation of the Apostles and early Church Fathers in our worship and practice. We are not the first on this journey of faith, and we will not be the last. Therefore, we seek to embrace those elements of worship and theology that clearly affirm the truth of the Gospel while continuing to seek fresh ways in which that truth can be expressed in our day. During the Reformation, the leaders who founded the Anglican Church were deeply committed to making the Scriptures available to all, ministering to people in languages they could understand, and uniting the church’s form of worship through a common liturgy. Our reformational heritage has bestowed on us a tradition that is centered in the Gospel and immersed in the Scriptures. Anglican theology is summarized in the 39 Articles of Religion while Anglican spirituality can be seen and experienced through the Book of Common Prayer. Today, versions of the Book of Common Prayer are used right here at Saint Peter’s and in Anglican worship services around the world. There are many wonderful churches that make up the Body of Christ throughout the world. Although Anglicanism is part of the Great Tradition of Christianity and has much in common with other Christian practices, it finds its distinct expression in four key ways. These four essential elements, outlined in the Chicago-Lambeth Quadrilateral, are the Nicene Creed, the Word of God, the two Sacraments of Baptism and Holy Communion, and the historic Episcopate. Although there are many expressions of Anglicanism throughout the world, Saint Peter’s is distinct from certain Anglican bodies in the West due to several key theological differences. At Saint Peter’s, we adhere to a historic, orthodox interpretation of the Christian faith.